2006 January 15: An airborne and ground observing campaign to test thermal protection systems in the fastest reentries since Apollo and probe the delivery of organics for life's origin by measuring the physical conditions during reentry. 2009 Sep 05 - Hayabusa SRC entry observing campaign is in preparation. More here. 2008 Jan 07 - First results from the post flight data analysis and interpretation were presented at the 46th AIAA Aerospace Sciences Meeting and Exhibit in Reno, NV. More here. 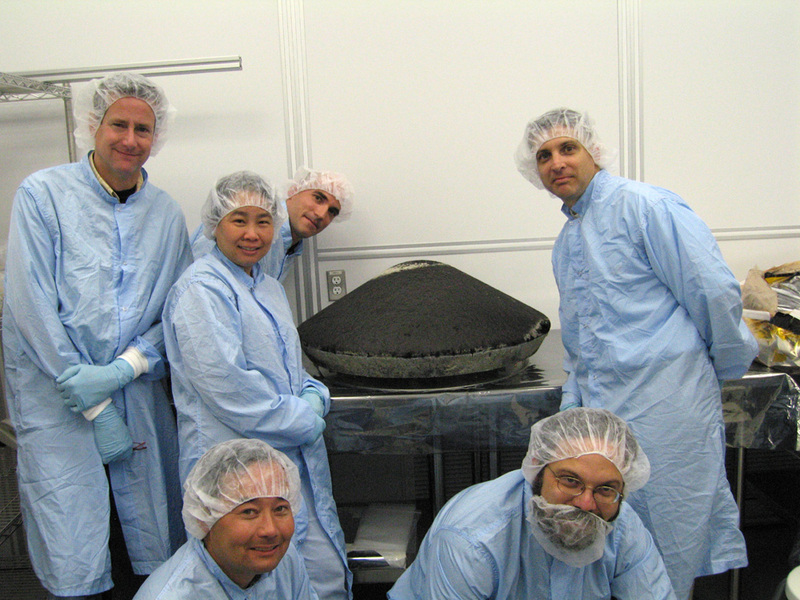 NASA Ames researchers at the JSC curation facility with the recovered Stardust SRC heat shield. Photo: Dean Kontinos/ARC. 2006 June 07 - NASA Ames researchers visited the space exposed hardware curation facility at the Johnson Space Flight Center to examine the recovered Stardust SRC heat shield. The total amount of ablated material lost from the heat shield was measured, to be compared to the observed rate of ablation during the reentry. 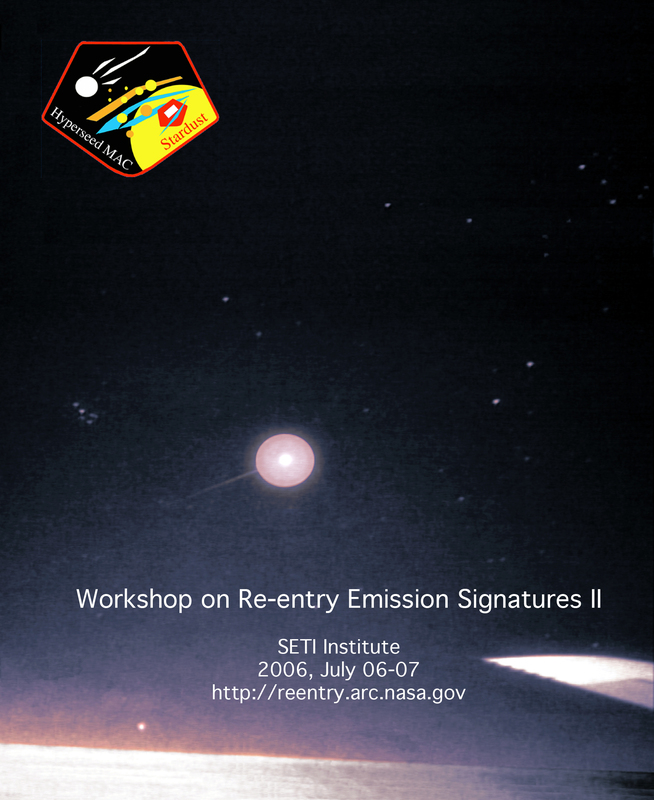 Results will be discussed at the upcoming Workshop on Reentry Emission Signatures II on July 6/7, 2006. 2006 June 16 - On July 6-7, a workshop was held at the SETI Institute to discuss the results from the Stardust SRC Entry Observing Campaign. All participants had to Register before July 05, 20:00 PST. 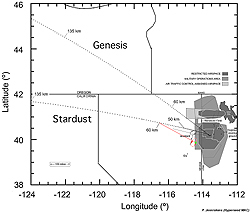 Results from the infrasound studies during Genesis were published in a paper entitled "Genesis - an artificial, low velocity "meteor" fall and recovery: September 8, 2004" (by D. O. Revelle, W. Edwards, and T. D. Sandoval) in Meteoritics and Planetary Science (Volume 40, p. 819-839). It was discovered that previously computed differential acoustic efficiencies were unreliable at Mach numbers below about 10. Similar measurements will be made during the Stardust SRC entry. Full paper. 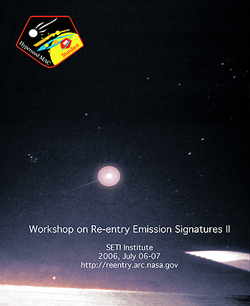 2005 Dec 10 - Participants in the Workshop on Re-entry Signatures presented data that predict a peak visible brightness of order -7 magnitude seen from a distance of 100 km, weaker at larger distances and when the capsule is seen from behind. The SRC becomes gradually brighter when penetrating deeper in the Earth's atmosphere and will peak over Carlin, NV. Observers immediately under the track near Carlin may see a meteor as bright as -9 magnitude, according to Peter Jenniskens, based on peak surface temperature calculations by Mike Wright of NASA Ames. The predicted emission shows many atomic lines from shock emissions. The figure above shows the highest elevation of the SRC above the local horizon from different sites. Lines were calculated by Marek Kozubal and Ron Dantowitz of the Clay Center Observatory at Dexter and Southfield Schools (map courtesy Google maps). Click on picture for a larger version. More information. 2005 Dec 09 - An international workshop was held to discuss the anticipated emission signatures of the Stardust Sample Return Capsule. Objective of the workshop was to bring together airborne and ground-based observers with researchers specializing in theory and laboratory experiments, to discuss aspects of the Stardust SRC entry that are of interest to further our understanding of thermal protection systems and natural meteors in hypervelocity reentries. In particular, about what emission signatures are to be expected and what debris and recondensed vapors might be created in the ablation process. 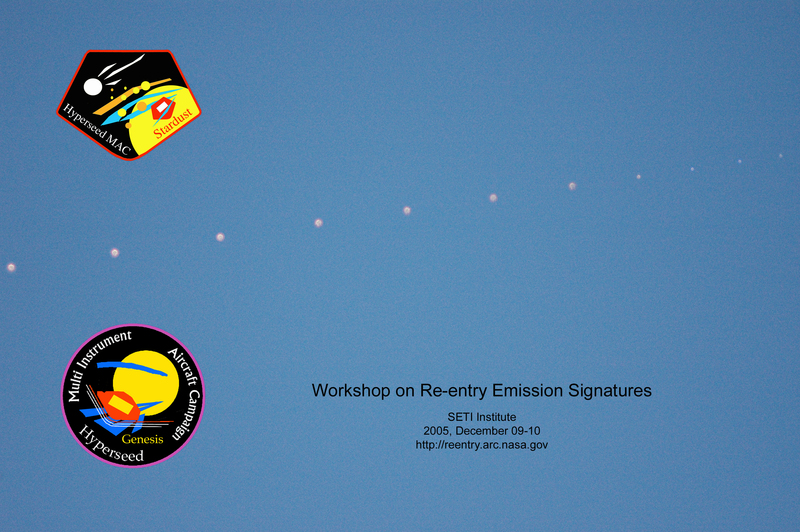 The workshop was on Friday afternoon December 09 and Saturday December 10, at the SETI Institute in Mountain View, CA. 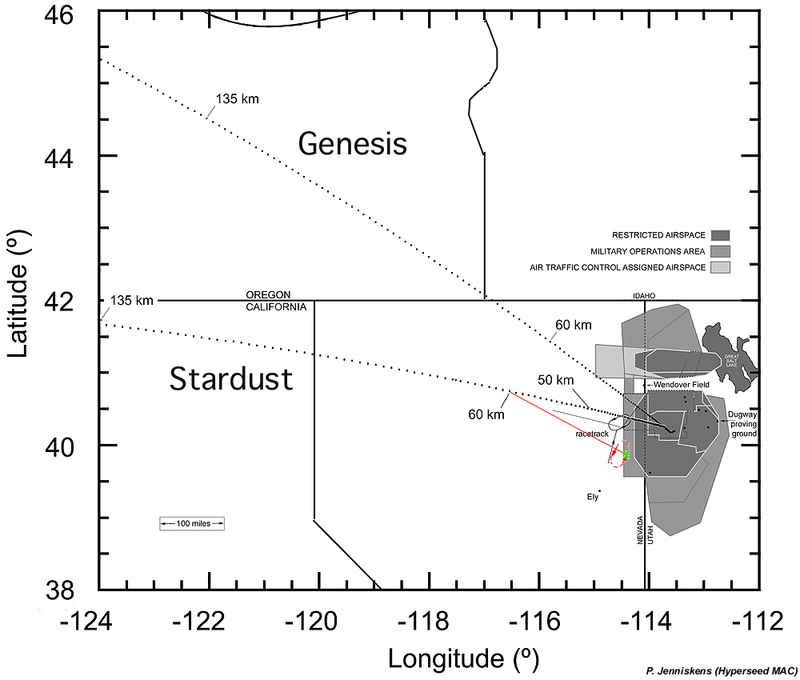 Stardust SRC approach trajectory (click on image for larger version). 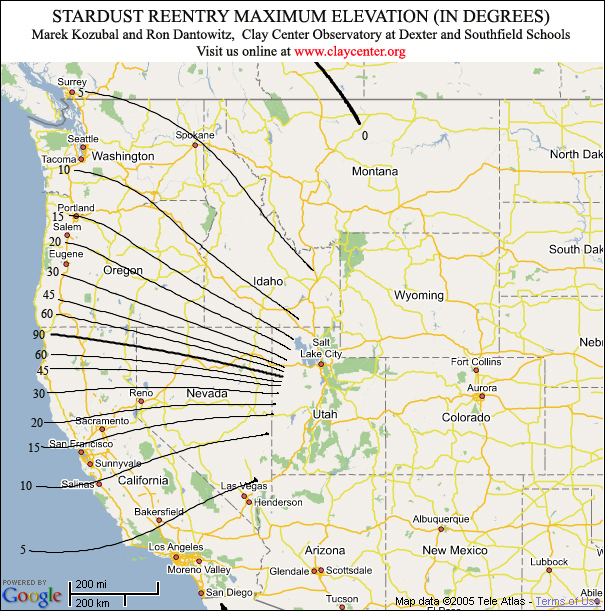 2005 Oct 23 - The Stardust SRC will approach UTTR from a West-North-Western direction on January 15, at around 03:00 MST (time will be known to within a second closer to the time of reentry). 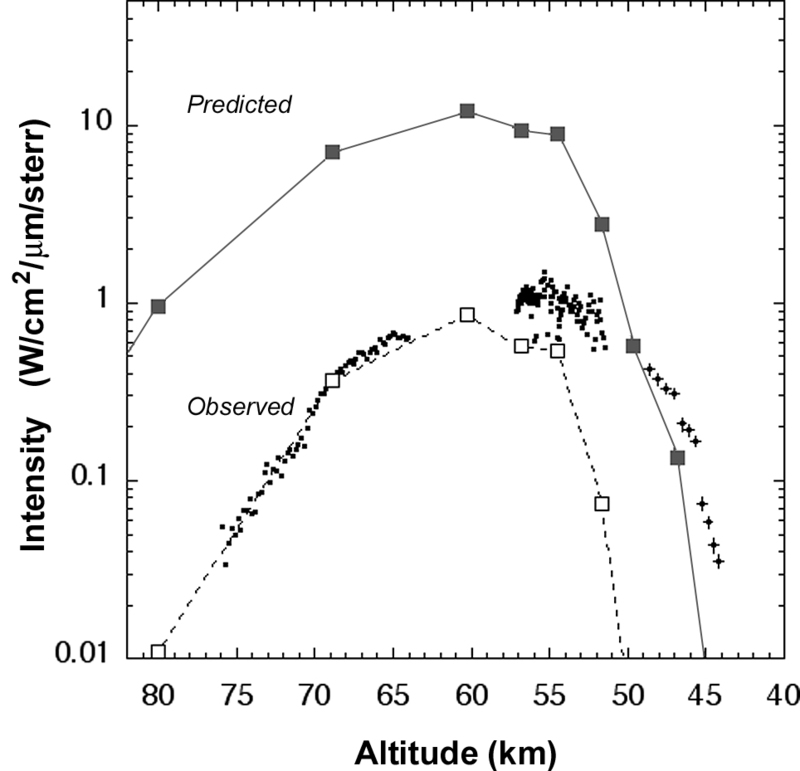 NASA's DC-8 will follow a racetrack trajectory just south of this path, outside restricted air space, oriented in such a manner that the point of peak brightness (at around 60 km altitude) will be the prime viewing direction. 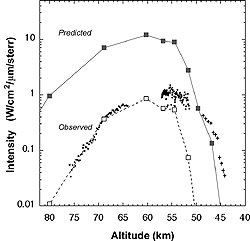 The projected SRC trajectory and flight path is shown in the figure above. Updates will be given as more information becomes available. 2005 Dec 16 - Contact was lost after the second sample collection effort on November 26, when the spacecraft was put in a spin. Control was not restored before the time window closed to bring the spacecraft back to Earth in June of 2007. The mission controlers now hope to return Hayabusa in 2010. 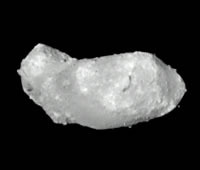 2005 Nov 28 - After a failed attempt, the Hayabusa spacecraft touched down on Itokawa and collected a sample of asteroid dust, according to Japan Aerospace Exploration Agency officials. If the robotic probe returns to Earth safely, it is scheduled to enter Earth's atmosphere over Australia in June of 2007. 2005 Sept 12 - Our Japanese participants, Shinsuke Abe and Hajime Yano, report that the Japanese spacecraft Hayabusa has arrived at the asteroid Itokawa and send back the first images. It now hovers at around 20 km from the asteroid, before a touchdown and sample collection in the months ahead. When Hayabusa returns to Earth in June of 2007, it wil provide another opportunity to observe a faster-than-escape-speed reentry over Australia. 2005 Sept 26 - Participants are meeting at the Dust in Planetary Systems meeting held in Kaua'i, Hawai'i', from Sept. 26-30, 2005. Stardust mission P.I. Don Brownlee will discuss results from the comet Wild 2 encounter. Akira Fujiwara will present first results from the Hayabusa mission to asteroid Itokawa. 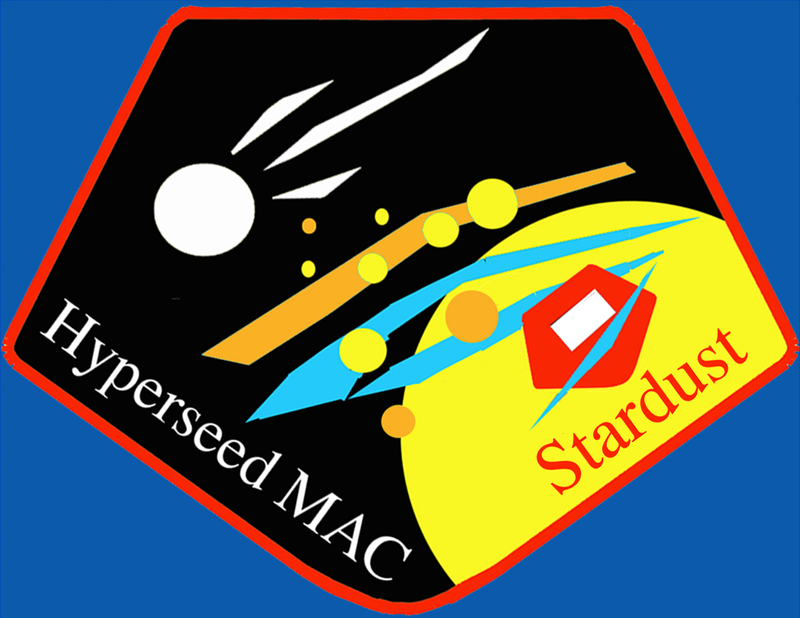 Peter Jenniskens will present a talk entitled: Hyperseed MAC: An airborne and ground-based campaign to monitor the Stardust Sample Return Capsule reentry on 2006 January 15. 2005 June 05 - A paper presenting the calculations of predicted radiation signatures made to prepare for the Genesis SRC Entry observing campaign is now in press. 2004 October 15 - A preliminary report with Genesis SRC Entry observing campaign results was submitted to the NASA Engineering and Safety Center in support of the Genesis Mishap Investigation. 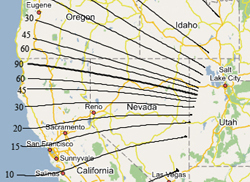 2004 September 08 - On September 8, 20 researchers onboard the USAF NKC-135 "FISTA" observed the Genesis SRC reentry from a location just west of the Utah Test and Training Range and at an altitude of 39,000 ft. All instruments were operational and ready for the observations. Dr. Mike Taylor of Utah State University got a spectacular video sequence of the reentry onboard the DC-8 aircraft using a Xybion intensified camera, from which this image is a partial frame. Above is an echelle spectrum from a moment during the Stardust SRC entry. Emission lines are identified. Result by Peter Jenniskens of the SETI Institute and Mike Koop of the San Jose Astronomical Asssociation. 2006 Jan 15 - The Stardust Capsule Reentry Observing Campaign has been a great success. All participating researchers onboard NASA's DC-8 aircraft detected the bright fireball and obtained data. The meteor was first blueish in color and then became a deep red. It was bright, slow, and glorious, and it pulled a wake lasting tens of seconds. We achieved all of our goals. We measured light identified as to come from the hot surface, air plasma emissions from the shock, and emissions from materials ablated from the heat shield. We expect to be able to learn from this how well the heatshield performed, what physical processes occur in natural meteors, and how life's first molecules may have originated from comet dust. Ron Dantowitz of Clay Center Observatory, lead of our ground team, reports from Tonapah, Nevada: "We had snow the day before and we had snow shortly after, but right at the time of the reentry there was a clearing in the cloud deck. The object was surprisingly bright at our location, about magnitude -2. We tracked on the object as soon as it emerged in a gap between the clouds, but lost it shortly after. 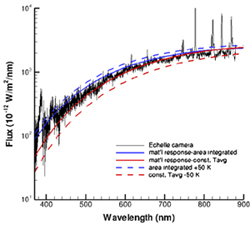 We obtained near-IR and visible spectra." Here is where to report your visual sightings, images or video if you know anyone who had viewing luck this morning. 2006 Jan 14 - Good news all around from JPL. The Stardust mission is good for entry after the first green button meeting. Even better news is that the targeting is sufficiently accurate that they will not be building an additional TCM post TCM19. Therefore, barring a safe mode in the spacecraft, the latest trajectory is about the best knowledge we will have pre-entry. TIME OF ENTRY (134.44 km over Crescent City, CA): 1:56:42.3 (��0.6 s) P.S.T. TIME OF PEAK HEATING (over Carlin/Elko area, NV): 1:57:33.6 P.S.T. Flight approval has been received to execute the DC8 observing campaign tonight as scheduled. It is raining now in Moffett Field. This will not delay departure, but will cause higher humidity in the cabin during takeoff. During the second test flight on Thursday night, there were no window frosting problems any more, but we have to see how the higher humidity affects this on tonights flight. Avoiding cloudy weather in northern Nevada, the ground grew has settled at Tonopah airport, further south of the trajectory. At that location, chances of clear weather tonight are good and the point of peak heating should be well observed, albeit from a larger distance. 2006 Jan 12 - Last night's test flight showed many instruments work well in the aircraft environment. We observed the reflected sunlight off an Iridium satellite, producing a bright -7 magnitude flare visible for several seconds. The aircraft was positioned correctly and the flare was observed as predicted. We practised pointing and count-down. Minor problems concerned frosting on the windows due to high humidity in the cabin and interference in video cables. Tonight's test flight will reveal if those issues have been solved adequately. Photo's from the test flight are posted here. Early this afternoon, at around 2 p.m. California time, the ground crew led by Ron Dantowitz departed for Nevada from the SETI Institute. Onboard is a telescopic tracker and a number of spectrographs that will observed the reentry from the ground, weather permitting. Operating out of Elko, Nevada, the team will choose their observing site as the weather dictates. 2006 Jan 11 - After several days of hard work by teams from NASA Ames, the University of North Dakota, and NASA Wallops, the various instruments have now been installed in the aircraft. Tonight will be the first test flight to practise setup and takedown during flight, check that the windows stay frost free, and test the perforance of the instruments in a flight environment. Joe Olejniczak, George Raiche, and Dean Kontinos (from left to right) welcome the DC-8 aircraft at Ames. Photo: Peter Jenniskens. DC-8 has arrived at Ames! 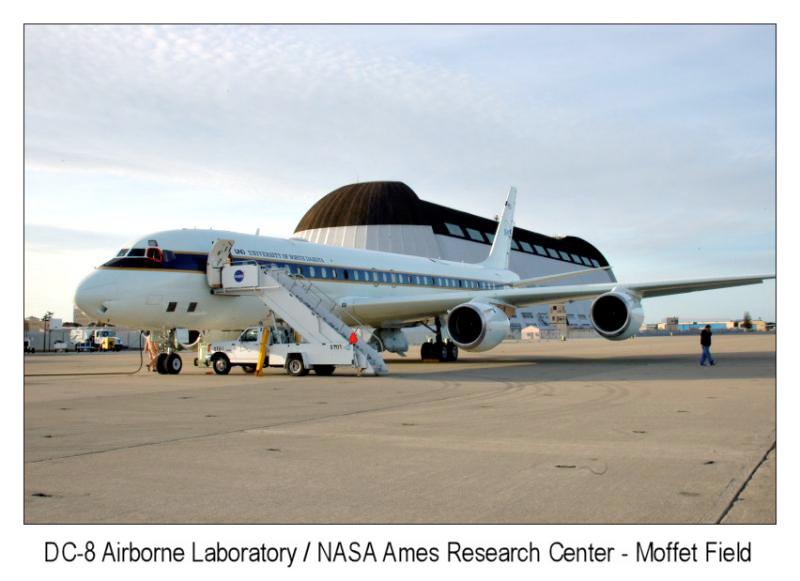 2006 Jan 04 - The DC-8 Airborne Laboratory has arrived at NASA Ames Research Center. Freshly painted with the University of North Dakota banner, the DC-8 performed pilot test flights this afternoon. Upload of instruments is scheduled to start early tomorrow morning. 2006 Jan 03 - Observers gathered in California to observe the Quadrantid shower as a test of instruments and to prepare for a future Quadrantid campaign. The weather looked abismal, but observers caught a break when the sky cleared between two rain storms for a short period of time in the early morning of January 03. The shower performed as expected. The highlight of the night was a bright yellow -5 magnitude Quadrantid with a train of 20 seconds. 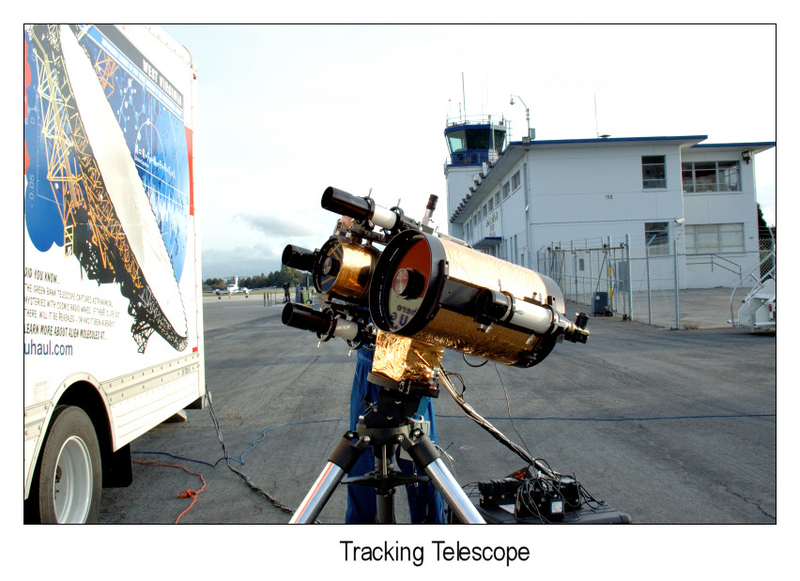 2005 Dec 29 - In support of the airborne observations, Ron Dantowitz and Marek Kozubal of Clay Center Observatory at Dexter and Southfield Schools will deploy this automatically tracking telescope to observe the Stardust Sample Return Campsule entry from the ground. Weather permitting, this experiment will focus on spatially resolving features in the wake of the SRC and provide a side view of the capsule at the time of peak heating. 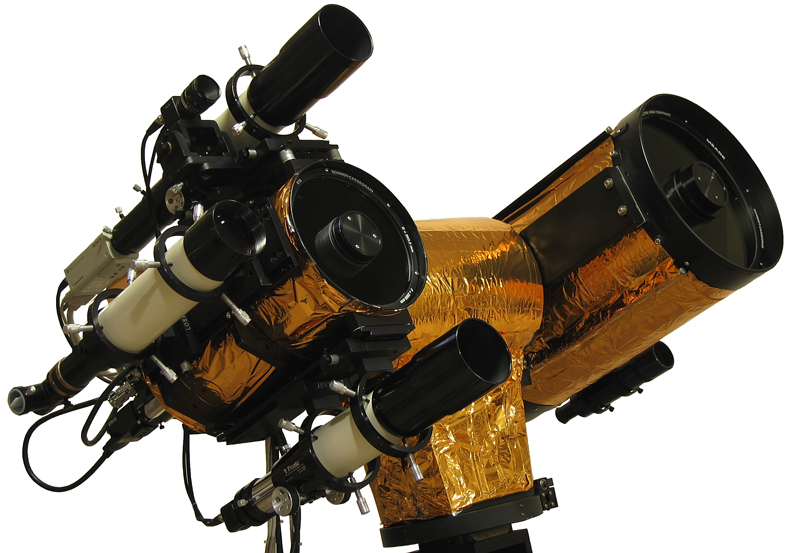 The system will be assembled at the SETI Institute on January 11. More on viewing from the ground. 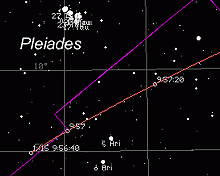 2005 Dec 16 - Observers onboard NASA's DC-8 airborne laboratory expect first to see the SRC approach as a faint point of light from a direction in between the star cluster "Pleiades" and the planet Mars, at that time low above the horizon in the constelation of Aries. Click on the map for an expanded view. Viewing conditions from ground sites here. 2005 Nov 08 - The new Stardust SRC entry observing campaign's mission patch design shows the Sample Return Capsule entering Earth's atmosphere, with the orange airglow layer marking the boundary with the realm of space. Target of the mission is the meteoric glow from the hot surface and shock and the capsule's ablation products in its wake. 2005 Nov 04 - Delay of Inter-center Aircraft Operations Panel Review until early December: this is a critical review that establishes the transfer of the DC-8 aircraft operations from NASA Dryden to UND. Approval is needed for UND to operate the DC-8 aircraft for our mission. The Stardust SRC entry observing campaign upload at Ames is now scheduled for early January. 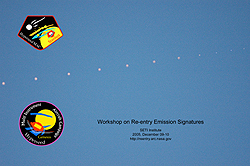 The workshop on reentry emission signatures will go foreward as planned, with delivery of instruments at Ames (time line). The floorplan has been adjusted to use existing installation hardware from the 2002 Leonid MAC mission. This, unfortunately, makes a Quadrantid mission test flight impossible. Instead, we now plan to use the Quadrantid shower as an instrument test in ground-based observations in the morning of January 03. Quadrantid shower instrument-test flight path (click on image for larger version). 2005 Oct 23 - NASA's Planetary Astronomy program has allocated funding for an extended test flight during the January 03, 2006, Quadrantid meteor shower. We already had planned to use the meteors as test objects for instrument checks and callibrations in a local flight from Ames. Unfortunately, this very narrow shower will peak over Europe this year, and night time rates in California will not be very high. With support of the Planetary Astronomy program, however, we can follow the Earth's shaddow and observe the Quadrantids along their entire 12-hour core activity profile, for the first time with a radiant high in the sky at all times (see Figure above). The Quadrantid meteors originate from a comet breakup about 500 years ago, leaving behind the now inactive minor planet 2003 EH1. Therefore, the Quadrantid instrument test will study meteoroids from deep within a comet and compare the properties of the meteoroids with those dragged by water vapor, such as the Leonids. 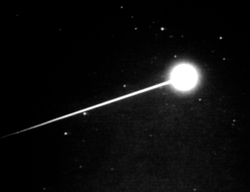 Ground-based observers are encouraged to study this year's Quadrantids as well, because the Moon will not interfere and the shower, at its peak, is known to be more intense than the summer Perseids. 2005 Sept 08 - NESC and ESMD have agreed to jointly fund Ames for the Stardust Airborne Observation Campaign. On 1/15/06, at 3 a.m. MST at night, the Stardust Sample Return Capsule (SRC) will be entering the Earth's atmosphere at 12.8 km/s, the fastest man-made object to traverse our atmosphere, delivering cometary dust samples to the Utah Test and Training Range. 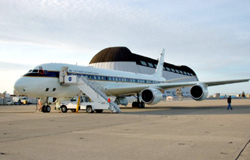 Ames will conduct an airborne observation of the entry, aiming spectrographic equipment from a DC-8. These data will be useful for validating aerothermodynamic prediction tools and assessing thermal protection system response of the Ames developed PICA material. Peter Jenniskens of the SETI Institute is the Prinicpal Investigator. An international team of participating researchers will deploy a wide range of cameras and spectrographs, using past experience from their particiaption in airborne Leonid meteor shower observating campaigns. 2005 Sept 19 - A new milestone was reached with the delivery of the DC-8 aircraft floorplan to the aircraft operators. The plan shows how the seventeen different instruments of participating Instrument P.I. 's may be accomodated. The plan will now be evaluated for compliance with aircraft operational constraints. 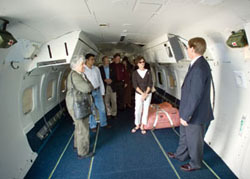 2005 Sept 14 - The new DC-8 operators at the National Suborbital Education and Research Center (NSERC) at the university of North Dakota celebrated today with the arrival in Grand Forks of NASA's DC-8 Airborne Laboratory from its former post at NASA Dryden Flight Research Center. Director Rick Shetter of NSERC provided these images of the touchdown. More here. 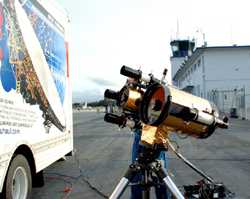 Dave Jordan of NASA Ames Research Center has been appointed the program manager of the Stardust SRC entry observing campaign and will take over this task from Paul Wercinski, who has been called to other duties. We thank Paul for bringing the Genesis SRC Entry observing campaign together and for leading us successfully to a follow-up mission, which will occur when the Stardust SRC returns back to Earth in January. 2005 June 14 - Participating researchers are finalizing a mission plan for observing the January 15, 2006, reentry of the Stardust SRC. 2005 June 21 - During yesterday's visit to NASA Dryden, we learned that several passenger windows can be replaced by optical ports. Two available ports are 9" diameter, two others 13" x 15" but with some obstruction from the sides of the aircraft frame. This means that all instruments flown on the Genesis SRC Entry camapaign can be accomodated on the DC-8 Airborne Laboratory. 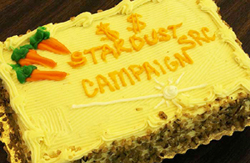 2005 June 14 - The UND Project Director for the DC-8 is willing and able to support the Stardust Mission from UND on 1/15/06. The following campaign, an INTEX-B mission in March, will begin integration on the DC-8 in early January. In order to support both missions it will be necessary for the Stardust mission to perform most of the integration during the first half of December. The goal is to minimize impact on the INTEX-B upload during the first few weeks of January. This now also makes it possible to do a test flight on January 3/4 during the Quadrantid shower. 2005 June 02 - NASA has signed a cooperative agreement with the University of North Dakota to operate NASA's DC8 Airborne Laboratory in the near future from Grand Forks, ND. The aircraft is scheduled to arrive at Grand Rapids in September. 2004 August 15 - A team of twenty scientists will get a chance to study the Genesis SRC reentry as an experiment to test the performance of thermal protection materials in the first interplanetary entry of a NASA spacecraft since Apollo and in support of any mishap investigation. The campaign is supported by the NASA Engineering and Safety Center, created in the aftermath of the Space Shuttle Columbia accident to serve as an independent technical resource for NASA managers and employees. 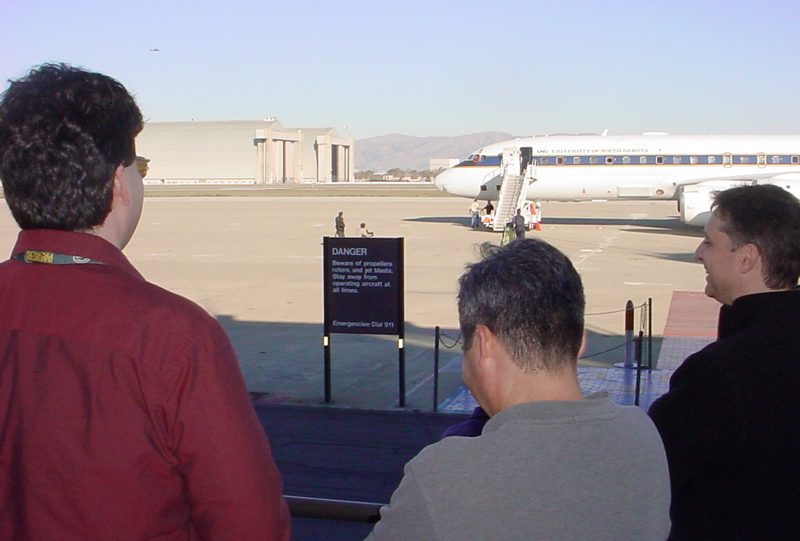 2004 June 24 - On June 22-23, NASA Ames Research Center hosted the SOFIA Upper Deck Science Opportunities workshop. This brought together many workers in airborne science. During lunch on June 23, we conducted a business meeting to discuss the Genesis reentry observing plans and the Hyperseed MAC mission and worked out details of the observing plan.